"The Antique Sandwich Company is a meeting place for people who love good food, music, and pie." I don't gravitate to this hippie hide-away on my own. It usually takes someone else to suggest we meet there. I do, however always enjoy the food. The shop is located in the tiny town of Ruston - just up the hill from Point Ruston. This time around, Peg's baby brother (Jim) and his wife (Jan) were in town for a short visit from San Diego. They were staying on Vashon Island with Peg and Jim's sister Marie. Jim suggested Antique Sandwich because he liked it and it was just up the hill from the ferry landing, where he and Jan would be hustling off to after we ate. 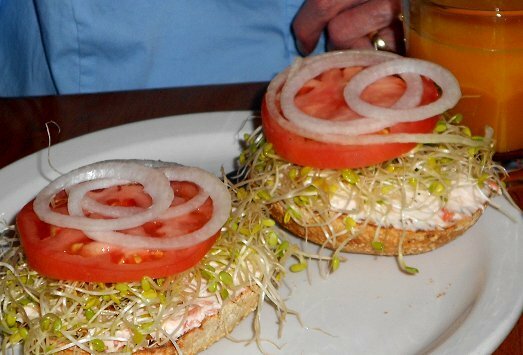 Peg ordered the cream cheese and sprout/tomato sandwich on a toasted bagel. She really enjoyed it. 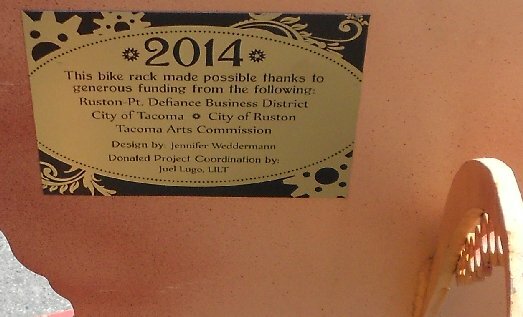 As we talked I shared an image of the Octo-bench and bike rack outside. 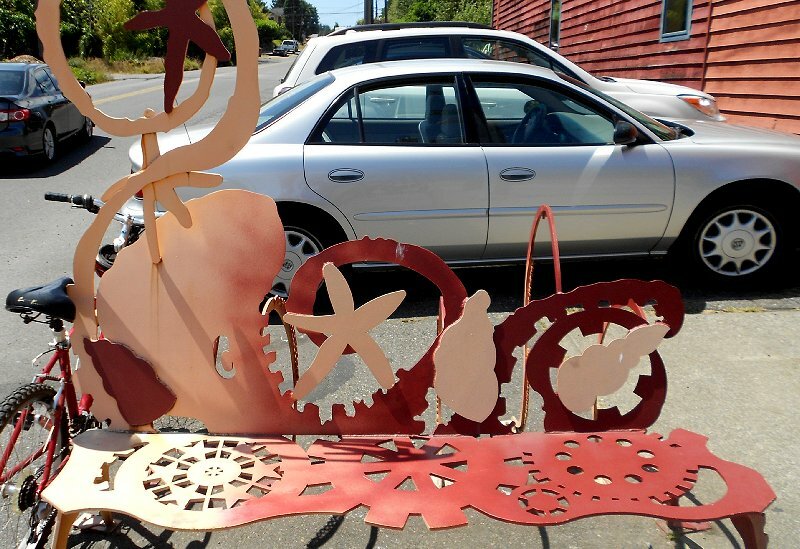 The bench has a feeling of Puget Sound marine life and the legs resemble the arms and suckers of our Giant Pacific octopus. Puget Sound is a popular dive spot, especially the area from Point Defiance to the Narrows Bridge, to see the octopus. 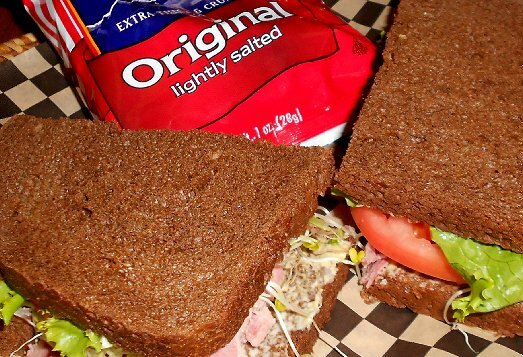 The Antique Sandwich Company is near the entrance to Point Defiance. The benches are located near bus stops inside Ruston. We pointed out the information on the back of the bench to Jim and Jan. The artist is Jennifer Weddermann. They had been admiring our metal sculpture on our lawn. 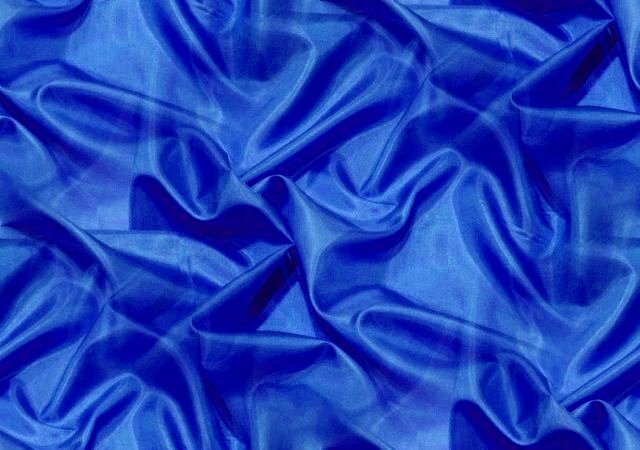 It was created by Jennifer as well. For lunch I ordered a corned beef sandwich on rye with a large glass of apple cider. The sandwich was excellent. I have had the fresh apple cider there before, so knew it was a treat. Peg ordered the fresh squeezed orange juice. It made her eyes spin. "It tastes like dessert," she said. It did. Next time around I might just have the orange juice. My cider went really well with the Tim's Cascade Potato Chips. Both Jim and I ordered the marionberry pie. The Antique Sandwich Company prides itself on its pies . . . as well it should. I shared mine with Peg and Jim shared his with Jan. The crust was excellent and the filling was thick and tart. According to Wikipedia, The 'Marion' cultivar or Marion blackberry, marketed as marionberry, is a blackberry developed by the USDA ARS breeding program in cooperation with Oregon State University. It is a cross between the 'Chehalem' and 'Olallie' blackberries. 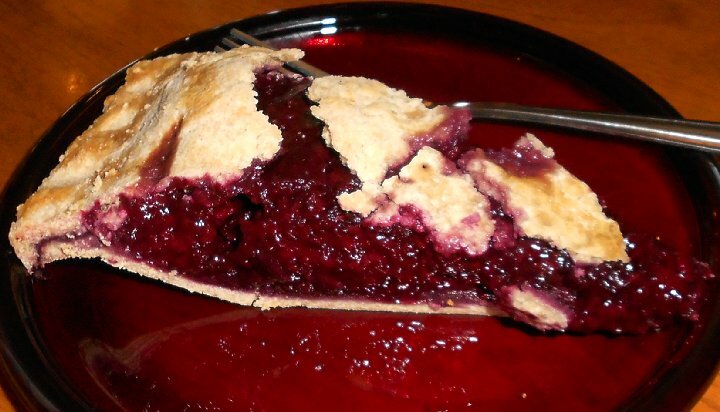 Blackberry pie or marionberry pie is a family favorite. The grandkids used to come and pick our blackberries, while our daughter-in-law Johanna would bake them in a pie. Now, our yard deer munch on the leaves, the blossoms, and probably the berries themselves. A nice relaxing summer afternoon could be perfectly spent eating marionberry pie, drinking freshly pressed apple cider, while sitting on the Jennifer Weddermann octo-bench, admiring the mural/sign and watching visitors pass by on the way to the entrance to Point Defiance or the ferry landing for Vashon Island. Antique Sandwich Company - Ruston, Antique Sandwich Company Review, Antique Sandwich Company Review 2017, Antique Sandwich Company - Ruston Washington WA.